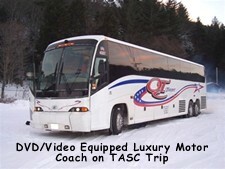 Transportation on TASC Ski and Snowboard trips is by DVD video equipped luxury motor coach busses. Occasionally, late model passenger vans are used, which enables the trip to go even if there are not enough skiers for a bus or the bus is full. Because of our commitment to high moral standards, we prefer not to show any movies on the bus that contain profanity, vulgarity, excessive violence or sexual content, regardless of rating. Student provided movies are not shown on the bus, unless a staff member, teacher or youth leader of the group has viewed and approved the movie.